Members of genus Skermanella were described as Gram-negative, motile, aerobic, rod-shaped, obligate-heterotrophic bacteria and unable to fix nitrogen. In this study, the genome sequence of Skermanella stibiiresistens SB22T is reported. Phylogenetic analysis using core proteins confirmed the phylogenetic assignment based on 16S rRNA gene sequences. Strain SB22T has all the proteins for complete glycolysis, tricarboxylic acid cycle and pentose phosphate pathway. The RuBisCO encoding genes cbbL1S1 and nitrogenase delta subunit gene anfG are absent, consistent with its inability to fix carbon and nitrogen, respectively. In addition, the genome possesses a series of flagellar assembly and chemotaxis genes to ensure its motility. The type species for the genus Skermanella is Skermanella parooens ACM 2042T, which was originally proposed as Conglomeromonas largomobilis subsp. parooensis by Skerman et al. in 1983 . Later, it was transferred to the genus Skermanella (family Rhodospirillaceae) on the basis of phylogenetic evidence and phenotypic characteristics, especially the inability to fix nitrogen [2,3]. At present, this genus comprises four validly published species, Skermanella parooensis , Skermanella aerolata , Skermanella xinjiangensis  and Skermanella stibiiresistens , which were isolated from fresh water, air, sandy soil and a coal mine, respectively. Skermanella was characterized as a Gram-negative, non-spore-forming bacterium with unicellular and multicellular phases of growth, an obligate chemo-organotroph and facultative anaerobe, unable to fix nitrogen, and with a high DNA G+C content. To the best of our knowledge, genome information for Skermanella members is still not available. In this study, we present the draft genome sequence of a Skermanella type strain S. stibiiresistens SB22T and compare it with the members of the related genera Azospirillum and Rhodospirillum. S. stibiiresistens SB22T is Gram-negative, motile, rod-shaped with single polar flagella and non-sporulating (Figure 1). Ten related strains with complete genome sequences belong to Azospirillum (3 strains), Rhodospirillum (3 strains), Acidiphilium (2 strains), Magnetospirillum (1 strain) and Acetobacter (1 strain). A total of 515 conserved proteins were identified among them using cluster algorithm tool MCL (http://micans.org/mcl/) with default values and a neighbor joining (NJ) tree was built based on this set. 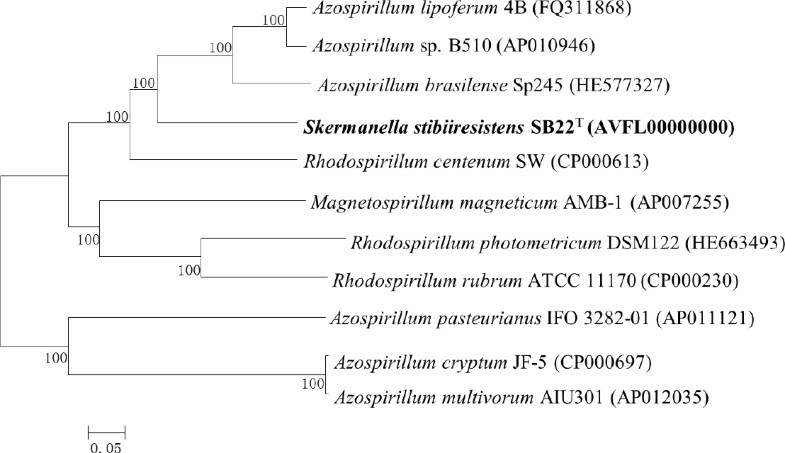 The phylogenetic tree showed that strain SB22T was closely related to the genera Azospirillum and Rhodospirillum, which was consistent with the taxonomy previously determined by 16S rRNA gene sequence analysis . Classification and general features of S. stibiiresistens SB22T are shown in Table 1. Figure 2 shows the phylogenetic neighborhood of S. stibiiresistens SB22T in a core-protein based tree. A transmission micrograph of S. stibiiresistens SB22T, made using a Hitachi H-7000FA transmission electron microscope operating at 100 kV. The scale bar represents 2 µm. A NJ phylogenetic tree highlighting the position of S. stibiiresistens SB22T with other completely sequenced strains that belong to the same family (Rhodospirillaceae). All protein FASTA files were obtained from NCBI. The corresponding GenBank accession numbers are displayed in parentheses. A total of 515 conserved proteins were identified using cluster algorithm tool MCL. The 515 amino acid sequences were aligned using Clustal W  and the NJ tree was built using MEGA 5.05  with boot strap value of 1,000. Classification and general features of S. stibiiresistens SB22T according to the MIGS recommendations . Evidence codes - IDA: Inferred from Direct Assay; TAS: Traceable Author Statement; NAS: Non-traceable Author Statement. These evidence codes are from the Gene Ontology project . If the evidence is IDA, then the property was directly observed for a live isolate by one of the authors or an expert mentioned in the acknowledgements. S. stibiiresistens SB22T was sequenced by Majorbio Bio-pharm Technology Co., Ltd, Shanghai, China. The draft genome sequence was deposited in NCBI with contigs less than 200 bp cut off. The GenBank accession number is AVFL00000000. A summary of the genome sequencing project information is shown in Table 2. S. stibiiresistens SB22T was grown aerobically in R2A medium at 28°C for 2 days. It can also grow on LB medium under the same conditions. The strain was apricot-colored after incubated 72 h at 28°C on R2A agar. The DNA was isolated using the QiAamp kit according to the manufacturer’s instruction (Qiagen, German). The Illumina Hiseq2000 technology with Paired-End (PE) library strategy was used to determine the sequence of S. stibiiresistens SB22T. A total of 7,588,874 × 2 high quality reads totaling 1,454,191,294 bp data with an average coverage 184.5 × was generated. Illumina sequencing data was assembled with SOAPdenovo, version 1.05 (http://soap.genomics.org.cn/). The initial draft assembly contained 7,879,677 bp in 257 contigs. Then the draft genome sequence was deposited to the NCBI with contigs less than 200 bp nucleotides cut off. The draft genome sequence was deposited to NCBI and was annotated though the Prokaryotic Genome Annotation Pipeline (PGAP), using the Best-placed reference protein set and the gene caller GeneMarkS+. Signal peptides and transmembrane helices were predicted by SignalP  and SOSUI , respectively. The WebMGA-server  was used to identify the Clusters of Orthologs Groups (COG). The final whole genome of S. stibiiresistens SB22T was 7,868,338 bp long in 190 contigs (with PEGs) with an average GC content of 65.88%. Of the total 7,378 predicted genes, 7,269 were protein-coding genes and 63 were RNA genes. A total of 5,176 protein-coding genes (71%) were assigned with putative functions with the remaining was annotated as hypothetical proteins. The property and the statistics of this genome are summarized in Table 3. 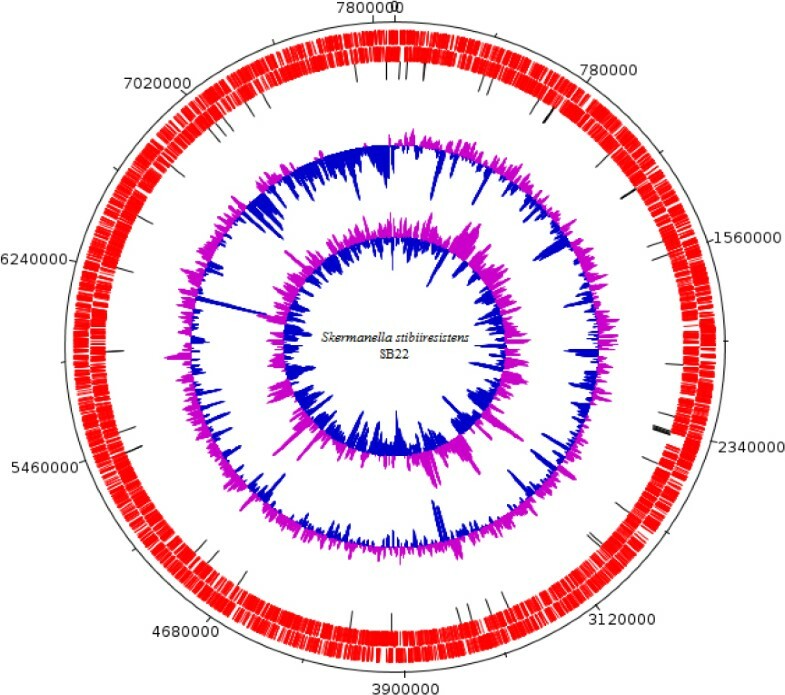 We reordered the contigs using MAUVE, version 2.3  with the complete genome sequence of Rhodospirillum centenum …() as a reference and a graphical circular map of S. stibiiresistens SB22T is shown in Figure 3. The distribution of genes into COGs functional categories is shown in Table 4. A graphical circular map of S. stibiiresistens SB22T. From outside to the center: Genes on forward strand, Genes on reverse strand, tRNA genes, GC content and GC skew. Number of protein-coding genes associated with the 25 general COG functional categories in S. stibiiresistens SB22T genome. The Kyoto Encyclopedia of Genes and Genomes (KEGG)  was used to reconstruct the pathways of S. stibiiresistens SB22T [Figure 4]. The metabolic pathways suggest that strain SB22T possess necessary encoding genes for central carbohydrate metabolism, such as glycolysis, the TCA cycle and the pentose phosphate pathway, to support basic growth. But it has relatively few lipid metabolism pathways. Only one integrated pathway that could synthesize tetracosanoyl-CoA from acyl-CoA is found in cytoplasm. This result indicates that strain SB22T might have certain limitations in some lipid utilization. Metabolic pathways of S. stibiiresistens SB22T as predicted using KEGG. Green lines indicate pathways that are possessed by this strain. Genus Skermanella belongs to family Rhodospirillaceae, but Skermanella species cannot fix carbon as Rhodospirillum centenum  and Azospirillum amazonense  do. Genomic analysis of S. stibiiresistens SB22T, shows that the RuBisCO encoding genes cbbL1S1 [24,25] are not present, which is in agreement with the strain’s inability to fix carbon. Strain S. stibiiresistens SB22T is closely related to some species of genera Azospirillum and Rhodospirillum . Genus Rhodospirillum is described as a photosynthetic non-sulfur purple bacterium that favors growth in an anoxygenic, photosynthetic, nitrogen-fixing environment . Some aerobic nitrogen fixing strains of Azospirillum have significant effects on crop plants . But genus Skermanella is unable to fix nitrogen under microaerophilic conditions [3,4,6]. Even though nitrogenase genes nifDKH are present in the genome of S. stibiiresistens SB22T, we found that the nitrogenase delta subunit gene anfG is absent. Many flagella genes were identified in S. stibiiresistens SB22T genome. A KEGG map demonstrates that this strain possesses a series of genes belonging to the families flg, fli and flh in flagellar assembly (Figure 5). These genes enable strain SB22T to move to a more suitable environment. In the same region of the genome as the flagella genes, we also identified genes encoding the central signal transduction pathway for chemotaxis (che), such as the conserved cheAWYBR genes and a group of transmembrane chemoreceptors (known as MCPs or methyl-accepting proteins), which are present in nearly all motile bacteria . The MCPs may sense environment signals and transfer them to the signal transduction histidine kinase CheA, whose activity is positively regulated by CheW. CheA in turn phosphorylates a response regulator CheYVB, which controls the rotational direction of the flagella motor . 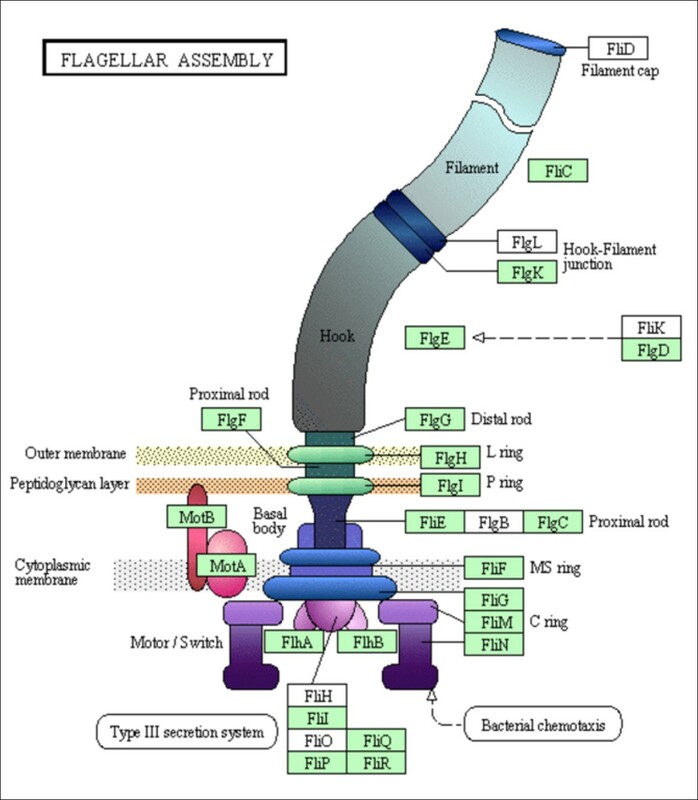 The KEGG flagellar assembly map. 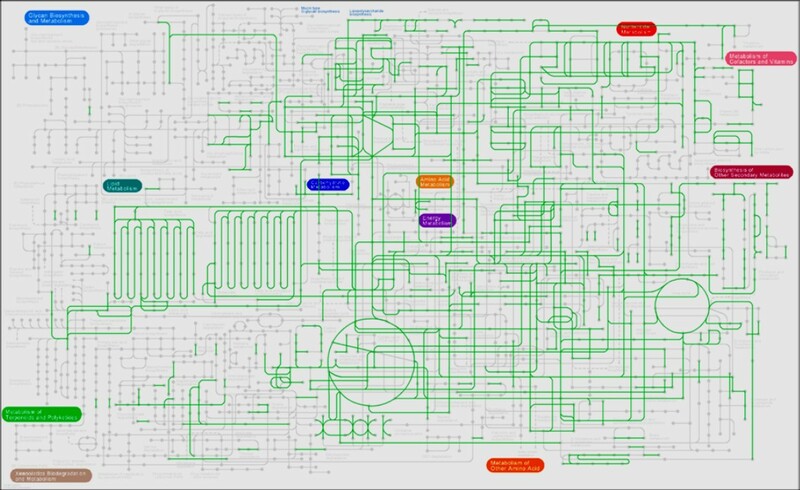 Green labels represent the flagella proteins that are encoded on the S. stibiiresistens SB22T genome. This work was supported by the National Natural Science Foundation of China (31170106).